Laying turf to create a lawn gives an instant effect and laying it properly means it will be easier to look after for years to come. 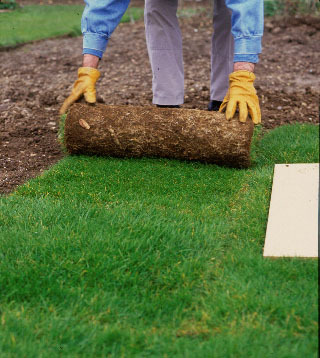 Seek out good quality turf, preferably from a specialist and choose a time when the weather is mild and the soil warm. A good lawn is a long-term project, so start with a good base. 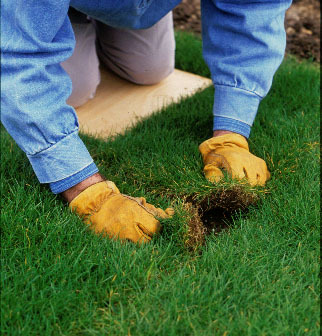 Good drainage is essential, so dig over (if necessary) to loosen the soil, then rake to level it and remove stones. 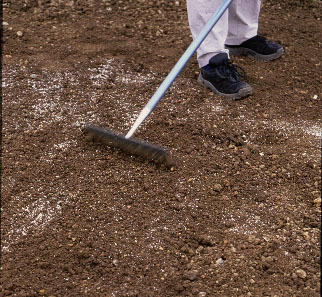 Add fertiliser and rake lightly into the soil. Starting at the furthest point, unroll the turf and lay it along a straight edge. It should be green and healthy-looking, not yellow. Lay brick-pattern, so the joints are staggered and press firmly so each roll is in good contact with the soil beneath. Use a board to firm the grass and save damaging it or creating depressions. Work loose soil into the joints to help the turves knit together quickly. Water well after laying to stop the turf drying and shrinking.